With its wide, typically pink or white blossoms, the saucer magnolia (Magnolia x soulangeana) is a popular spring-blooming yard tree. 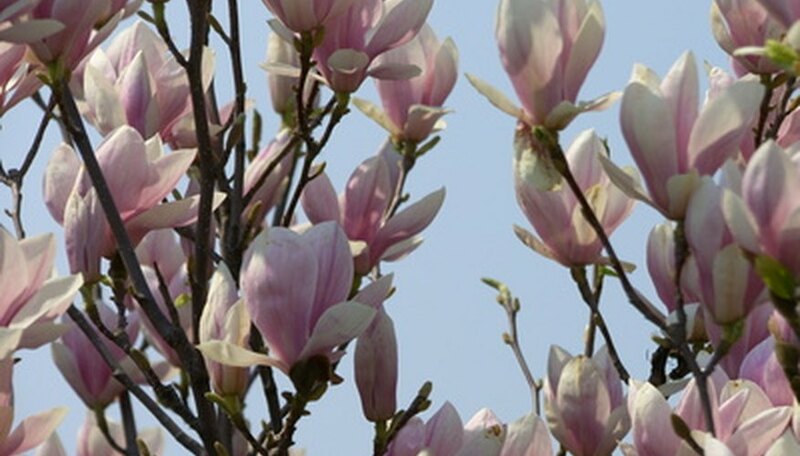 According to the University of Florida, cuttings are the preferred way to propagate most magnolia species, including the saucer magnolia. Wait until the tree has begun to grow in the spring to take cuttings; while you can take cuttings any time you see new growth, taking cuttings in the heat of summer can stress your magnolia tree. Wait three to four weeks after your saucer magnolia has developed new growth. At this time, the new growth should appear fairly soft and not yet woody. According to the University of Florida, softwood cuttings root faster than old wood cuttings, typically within five to eight weeks. Take several cuttings of the magnolia's soft wood, using anvil pruners. Cut back 5 to 6 inches from the tip of the branch, cutting just below a node or swollen tissue. Since not all cuttings will root successfully, take more than you need. Pluck off leaves growing on the bottom third of your cutting, roughly 1-1/2 to 2 inches. Prepare a soil mixture for your cuttings by mixing peat and perlite in a 1:1 ratio. Place this soil mix in a long trench container or into individual 4-inch pots for the number of cuttings you intend to root. Prepare an indolebutyric acid (or IBA) rooting hormone with 5,000 to 10,000 ppm IBA mixed in water, following the instructions on your rooting hormone package. Dip the bottom 1 to 1-1/2 inches of each cutting in your IBA rooting hormone solution, holding it in the rooting hormone mix for five seconds. Then stick the saucer magnolia cutting in the soil so that the bottom 1 to 1-1/2 inches of the cutting are covered by soil. Root all cuttings in this manner, spacing the cuttings 3 to 4 inches apart. Water the newly planted magnolia cuttings. Place them in a humid environment--the University of Florida recommends a room with constant ambient temperature of 65 to 75 F--where they will receive light. Mist the cuttings once or twice daily to maintain a moist, humid environment. Use a spray bottle to mist them by hand. Plant the cuttings in your yard once they have developed roots, using a small shovel to prepare the holes. Place each cutting in a full-sun location in a hole that's wider than its root structure, and plant it at the same depth as it lay in the soil mix.